Dairy free, coconut milk yogurt is as easy as 1-2-3. Grab all your ingredients, put them together and tomorrow morning you can enjoy a yummy coconut milk yogurt that everyone will love. Sterilize your yogurt holding receptacle. In a small bowl, add the gelatin and ¼ cup of the coconut milk. Stir and set aside. Place your coconut milk in saucepan and begin heating. After one minute has passed add your coconut milk'gelatin mixture. Heat until the temperature reaches 180° Fahrenheit. Remove from heat and let cool to between 110° and 120° Fahrenheit. 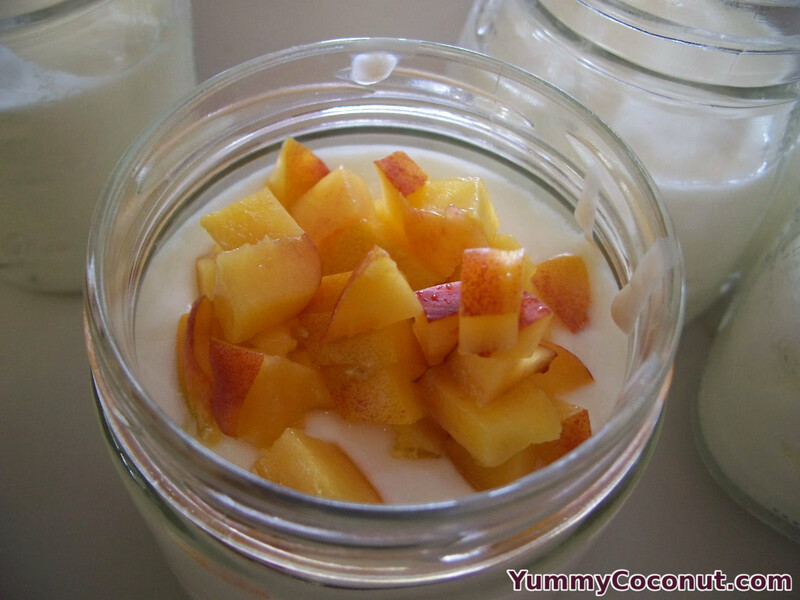 Place coconut milk mixture into your yogurt receptacle and stir in the yogurt starter. Cap and place in cooler. Add hot (100°-120° Fahrenheit) water to the cooler, up the the lid on your jar. Close cooler and let sit for 8-24 hours. Remove from cooler, chill and enjoy! If you don’t want to add gelatin you can add agar agar powder instead. Use the same amount as you would the gelatin. You can make the yogurt without using any thickeners but it will be very thin and runny, which works perfectly for a coconut yogurt drink or smoothie. Using more gelatin/agar agar will make the final yogurt stiffer, like a gelatin (Jello) desert mix. Add between 2-4 teaspoons depending on how you would like the final consistency. In order for the gelatin or agar agar to thicken the yogurt, it will need time to fully cool. Once cooled, your coconut milk yogurt will likely have some separation. Just shake or mix before serving. The fattier your coconut milk, the thicker your final product will be. Your yogurt starter can be made from cow’s milk yogurt or from a non dairy yogurt such as soy yogurt or coconut milk yogurt. Make sure that the yogurt is fresh and it says on the container that it contains live bacteria. If the bacteria is not alive, it cannot create yogurt for you. The hot water in a cooler method is just one of many ways you can keep your yogurt at a nice warm temperature for the bacteria to grow. If you have a slow cooker with a “warm” setting, you can put the yogurt in the slow cooker and leave it on warm for at least 8 hours. You can also put your yogurt in a pot filled with water and keep the water heated to around 100° to 110° Fahrenheit, this method takes a lot more time and effort because you will be constantly checking the water to see if it needs to be warmed. Insulate the sitting pot with a large towel to try to minimize the heat bleed off. There are also a ton of different commercial yogurt makers that you can use to keep your yogurt warmed. You can substitute the coconut milk in this recipe with any other milk (cow’s milk, almond milk, soy milk, etc …) to create any yogurt you like.